Flexibility to perform a wide variety of tasks in a small office. 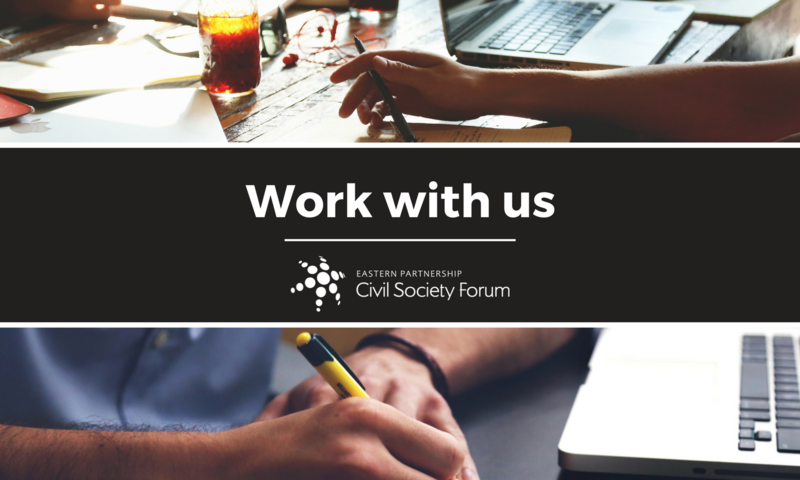 If you are interested in the position, please send your CV and Motivation Letter to secretariat@eap-csf.eu by 22 June with the reference: “Communications Manager”. Only candidates selected for interview will be contacted. The Eastern Partnership Civil Society Forum (EaP CSF) was established in 2009 and aims to support Eastern European countries’ sustainable reform process with a view to accelerating their political association and economic integration with the EU. The Forum strengthens the diversity and plurality of public discourse and policymaking by holding governments and public authorities accountable to the commitments made in the joint declaration of the Prague Eastern Partnership summit, signed by the EU and the governments of the six Partner countries. See www.eap-csf.eu for further details. The Secretariat of the Forum was registered in 2012 as an international non-profit organisation in Brussels, Belgium. The Secretariat serves as an information, coordination and expertise hub for the participants of the Forum, the bodies of the Forum, and stakeholders in Brussels and Eastern Partnership countries. It works to support the activities of the Steering Committee and enhance the advocacy and visibility of the Forum.